Geotest has announced the release of the GX2065, a 6.5 digit PXI DMM for high performance measurement applications. The GX2065 is a full-featured, multifunction DMM and offers all of the capabilities associated with standard bench top DMMs including DCV, ACV, 2 and 4 –wire resistance measurements, and current measurements. Additionally, the GX2065 features a 3 MS/s, 16 bit, isolated input digitizer which allows users to acquire and analyze waveforms. 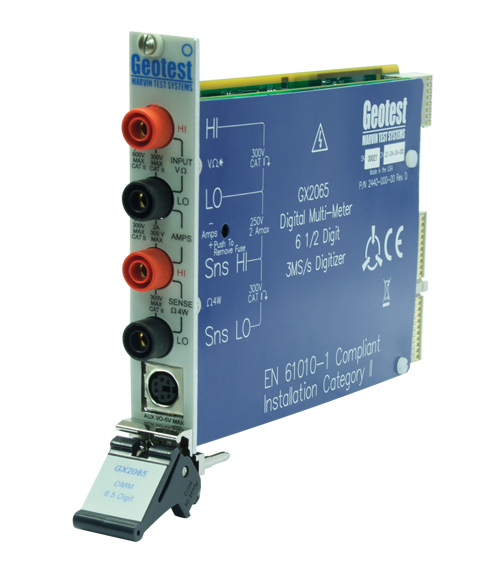 The GX2065 is supplied with a software package which includes a virtual instrument panel and Windows 32/64-bit driver libraries for ATEasy, LabView, LabView/Real-Time, C/C++, Microsoft Visual Basic®, Linux 32/64, Delphi, and Pascal. Compatible drivers for the Signametrics SMX2040 & SMX2060 DMMs are also supplied, allowing customers to easily upgrade existing applications to the GX2065.